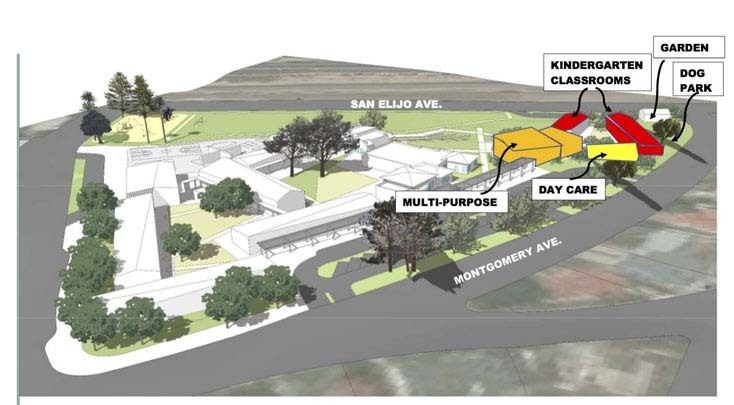 ENCINITAS — A proposed redesign of Cardiff School’s campus has prompted a group of residents critical of the proposal and its swift approval to start a petition drive to stop it. The Cardiff School District recently unveiled a proposed redesign of the 66-year-old campus. The configuration includes the placement of the school’s multipurpose room and kindergarten classrooms on land that is currently part of the district-owned George Berkich Park. The redesign is being funded by Measure GG, the $22 million bond measure voters approved in November. District officials last year said the bond proceeds would be used to rebuild, upgrade and renovate district facilities. 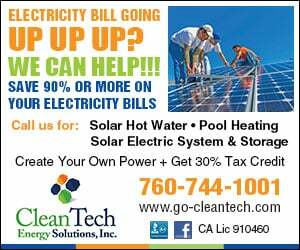 Planned improvements included replacing leaky roofs, renovating or replacing deteriorating plumbing and sewer systems and upgrading inadequate electrical systems. Rebuilding Cardiff School’s 65-year-old classrooms and replacing aging temporary portables with new classrooms at Cardiff School and Ada Harris School were also planned. Additional plans included constructing a new multipurpose room to replace Cardiff School’s 55-year-old multipurpose room and moving it closer to the school’s main entrance to provide a safer campus layout. The new campus redesign calls for an open-air multipurpose room and kindergarten classrooms adjacent to the main entrance on land that is currently part of the Berkich fields. The baseball field would be eliminated under the proposal, and the district would join the two grass fields, currently separated by playground equipment, to create a longer, contiguous field that could be host two soccer matches. School district officials have defended the new layout, which they said would make the campus safer and better suit the needs of the school’s students. “We know that there are a few neighbors who are concerned about the loss of views, but we made our decisions looking at the bigger picture of having the best interest of the students and the community at large in mind,” Cardiff School District Superintendent Jill Vinson said. Cardiff School Principal Julie Parker said that she feels the new design will make the field more useable to students and the public. With the current configuration, students don’t use half of the field because of lack of supervision. The baseball field on the southwestern edge of campus is rarely ever used, even by the community, Parker said. “By making one large field, it becomes a greater asset to our students, and every step of the way, we have had the needs of our students in mind first,” she said. But a group spearheaded by Cardiff resident Daniel Littrell, who lives across the street from the campus, cried foul over the redesign, arguing that this was not what voters thought they were getting when they voted for Measure GG. Littrell used the phrase “bait and switch” to describe the district’s actions. Littrell’s protest is gaining steam: At the time of publication, Littrell said 75 people have signed the petition on the website cardiffpreservationsociety.com. Littrell said in an interview with The Coast News that the district in the months preceding the election presented diagrams in meetings that showed the campus’ configuration unchanged. He saw the diagrams on the district’s website. He then attended a meeting in August when, for the first time, the district unveiled the new proposed campus layout. Littrell said of the 10 residents in attendance at the meeting, nine were shocked by the proposal. Littrell said the new layout will block the views that residents have enjoyed along Montgomery Avenue and replace them with large buildings. Vinson said the diagrams shown before the election were not meant to be the final designs, a point she said the district made clear at the workshops. The same went for the ballot language, Vinson said, which gave a general framework for the work that would be completed on campus. The district couldn’t craft the complete plan until it had its construction and design team in place, which occurred after the election. “We could have communicated that better to people who didn’t attend the meetings, but we tried our best to communicate with residents every step of the way,” Vinson said. Littrell said he understands the needs for the district to upgrade the antiquated campus, but he argued that the district has gone beyond needs and is splurging on luxury upgrades, such as the outdoor amphitheater. He also questioned whether the district considered other layout options that would have a less dramatic impact on the campus layout. For example, he said, the district could have switched the auditorium and one of the classrooms on the campus’ periphery adjacent to the main office. Vinson said the district’s architect considered other layout options, but determined the proposed layout was the most viable option. The campus, Vinson said, sits on a slope and placing the multipurpose room in a different location would block ocean views. Vinson said that the school board will address concerns about the site layout at the Oct. 12 board meeting.